It’s a great thing to be making a living for yourself and having complete control over your finances. Once you have built a successful business and you are doing well, it means you can provide yourself with things that you have been dreaming of for a while whether it’s a house renovation project or that designer bag you’ve been lusting over since you were a teenager. However, I would encourage you to look at that new kitchen tile or beautiful purse and ask yourself – how is this going to benefit my business? Most likely the answer is, it won’t. If you have built a business which is providing you with the means to live the life you have always wanted to live then maybe it deserves a little bit of a reward. You owe it to your business to put something back into it to allow it to grow and continue to provide you with as much as possible. This is where investment comes into play. Investing a chunk of your income back into your business can ultimately boost your earnings so you can continue to invest and grow and hey, maybe you can get TWO designer bags with your new increased income? It’s all about planning for the future and creating a sustainable environment for your business to grow. Of course, as a branding and web designer, I’m going to recommend that an area you look to invest in is branding. Branding is a top priority when it comes to running a successful business. Having a strong brand image and identity can mean you get noticed more and more exposure means more clients! Branding can seem like a big investment in the beginning which means you may have started with a DIY job which is great, but maybe doesn’t have the longevity or integrity you can get from something designed personally for you and your business by a professional designer. Once you have the income to invest, branding is a great area to focus on. One of the best decisions I have made this year is to hire a business coach. My coach helps guide me to bring clarity and focus to my business and make decisions which will build me a sustainable life. But there are coaches which can help with all areas of business whether it’s taking you to the next step, completely pivot your services or building a community. Do some research online or reach out to your community on social media to find recommendations and testimonials for people to help with your specific needs. I also think you should make sure that you will be on the same level as your coach before pressing the red button. Your relationship will be a close one and it’s important to get on so read through their website, blog posts and social media to make sure you will be able to work together well. The investment that pops into mind when thinking about moving forward with your business is to hire a team to support you. But there are so many tasks to allocate and so many things to be done, how do you decide who to hire? This is where a Virtual Assistant comes in to play. VA’s are new to the game and basically offer help with everything online (pretty self-explanatory, huh?). Instead of hiring a social media manager, a copywriter, a designer and an admin assistant, you can hire a VA who specialises in several tasks and then you can delegate whatever will fit with your workload. At the end of the day, if you are running a business on your own, the best way to invest in your business is to invest in yourself. There are hundreds of online courses made by business owners who have used their expertise to build their own businesses and their advice is priceless. If there is an area you struggle with, educating yourself is invaluable compared to hiring someone to do it for you. 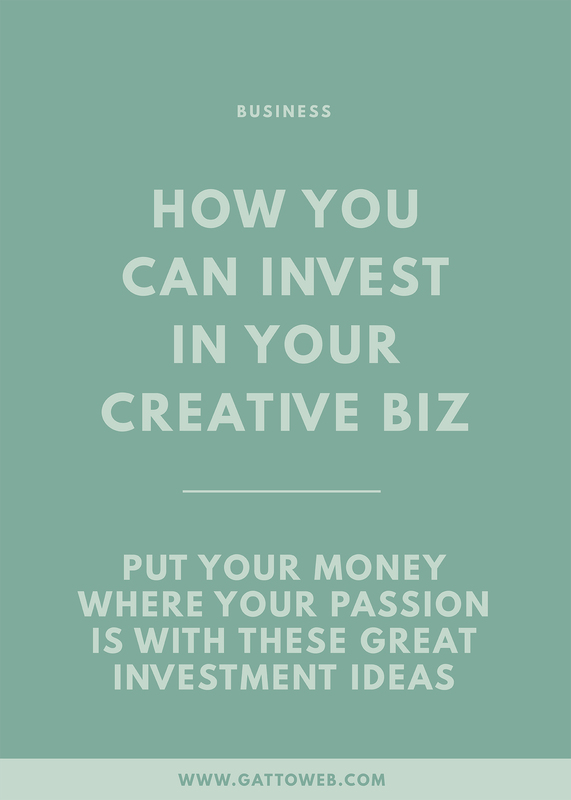 What investments have you made in your business? Is there something you'd like to invest in soon? Share your story in the comments!